and Days of Fire at hand. The Treason of Isengard is the seventh volume of The History of Middle-earth and holds particular interest for the reader in its exploration of Tolkien's plans for the plot and the characters of his story vs. the actual published version. Many of the peoples, places and sub plots are shown to have been transformed dramatically from the first and subsequent concepts to the final form. Such is the case with the short poem above. Many of us who know the final version by heart, find it interesting, indeed, to read such first drafts. Anyone who loves The Lord of the Rings and revels in the intricate detail that always appears so well thought out and planned, will find it fascinating to read about how the many different and diverse versions of this story were written, re-written, thrown out, abandoned and re-invented in order to give the story it's vibrance and drama. ♦ Of critical importance and great interest is the re-working of the maps of Middle-earth in order to define and anchor the emerging story. ♦ For those who participate in the great debate over the relationships between Aragorn and Arwen vs. that of Aragorn and Eowyn, here are Tolkien's first notes that show the love and marriage of Aragorn and Eowyn, before he had ever brought Arwen into the story. ♦ Here, too, are the original accounts of the Galadriel/Keleborn gift givings. They are quite different from the final form. Did you know that Galadriel originally gave the Elfstone to Gimli? Well, she did. ♦ It is here, also, that you first learn that Tolkien planned for the Fellowship to break apart quite differently than in the final text. 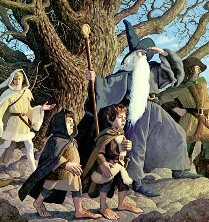 Of course, Sam and Frodo head for Mordor, but did you know that Legolas and Gimli originally were planned to travel back north to Lothlorien to be the first to be re-united with Gandalf? Would it surprise you to know that Tolkien originally planned for Aragorn to travel south to Minas Tirith with Boromir, and there they would fight each other for the right to lead the people of Gondor, and that when Aragorn was victorious, Boromir traveled north and became allied to Saruman? Fascinating reading.